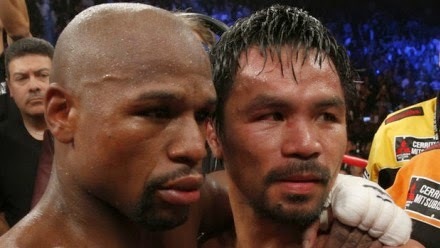 Hopes that Floyd Mayweather would agree to a rematch with Manny Pacquiao have been dashed after the undefeated American branded the Filipino a "coward" and a "sore loser". He made the comments in an interview with US broadcaster Showtime to be broadcast this weekend, in which he said he had changed his mind after apparently agreeing to fight Pacquiao again. In the interview Mayweather scoffs at the notion that his victory over Pacquiao in last weekend's 'Fight of the Century' was down to a shoulder injury sustained by his opponent two weeks before the fight. "Excuses, excuses, excuses," said Mayweather. "He lost. He knows he lost. I lost a lot of respect for him after all of this." Pacquiao underwent surgery on a torn rotator cuff in his right shoulder on Wednesday and will be out for up to a year. But Mayweather was adamant that it had no influence on his unanimous points win at the MGM Grand Arena. "He was fast," he said. "His left hand was fast, his right hand was fast and he was throwing them both fast and strong." Immediately after the fight Mayweather confirmed that he planned to retire after one more fight in the autumn, an announcement that appeared to end any hopes of a rematch between the two rivals. However, fans hoping for Mayweather vs Pacquiao 2 were thrown an unexpected lifeline when Mayweather subsequently told ESPN journalist Stephen A Smith in a text that he would be prepared to fight the Filipino again. But now it seems he has changed his mind. In the interview Mayweather admitted sending the message but said simply: "I change my mind." He also appears stung by Pacquiao's refusal to acknowledge that he is a better fighter. When asked about the possibility of another fight he said: "At this particular time, no, because he's a sore loser and he's a coward... If you lost, accept the loss and say, 'Mayweather, you were the better fighter.'"